"This recipe was given to me 41 years ago by my husband's grandmother." Combine raisins and water in a small saucepan. Boil 5 minutes. Blend brown sugar, cornstarch, cinnamon, and salt together; add to hot raisins. Cook and stir until syrup is clear. Remove from heat, and stir in vinegar and butter or margarine. Cool slightly. Turn filling into a pastry lined pan. Cover with top crust. Seal edges, and cut slits in the top crust. Bake at 425 degrees F (220 degrees C) for 30 to 35 minutes. 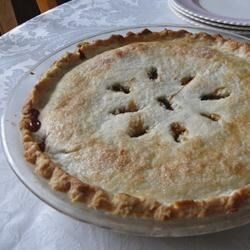 Watch how to make this simple peach pie. This wasn't what I expected. If you really, really like raisins, then you would probably rate this 5 stars. This is EXCELLENT raisin pie. I used frozen pie crust and it turned out great. For anyone who has never tried raisin pie, try this one. It is YUMMY!